Arnold Schwarzenegger needed multiple takes of his Super Bowl commercial because he wasn't very good at ping pong. 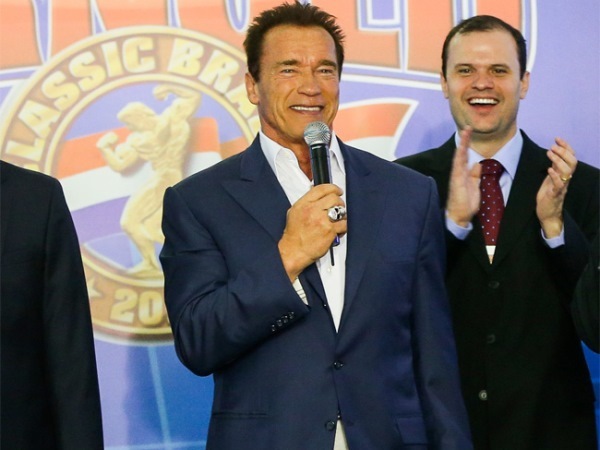 Arnold Schwarzenegger needed multiple takes to shoot his Super Bowl commercial. The Terminator actor received a $3 million pay cheque for the Bud Light advertisement, which was shot over two 16-hour days, and had to work hard for his money because his ping pong skills weren't great. A source told the New York Post newspaper: "Arnold plays a ping pong player who challenges a guy who is on a fantasy night out. "They kept having to do re-takes as Arnold wasn't very good at ping pong. He swings and he misses. He's clearly better at barbells." The beer company have already started releasing teasers for the commercial, which show the former Governor of California limbering up in a blonde wig, 70s-style tracksuit and elastic headband, and it is believed the full advert is around two minutes long. This would make it one of the most expensive commercials ever as a 30-second slot during the famous football game costs $4 million. The Conan the Barbarian star isn't the only famous face to appear in the commercial, which is directed by Jackass producer Jeff Tremaine, and was mostly shot in a "wild" club based in 4 World Trade Center. The short film - which has the slogan The Perfect Beer for Whatever Happens - sees an unsuspecting man picked up in a Hummer stretch limo and taken on a wild journey. He runs into Don Cheadle - who is in an elevator with a llama on a leash, DJ Reggie Watts and Minka Kelly, who plays a girl who propositions the guy. The advert ends with the guy defeating Schwarzenegger in their ping pong match, with the actor then shouting "Where do you think you are going?" before leading the man into the party.